Warning! You may not know what you’re putting into your body! In fact, a common ingredient in some of your food selections, emulsifiers may be causing you some severe health issues, namely when it comes to healthy gut bacteria. 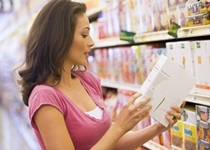 Learning how to eat healthy can be a challenge, especially when it comes to processed foods. Marketers may toss terms like “fat-free” or “now with less sodium” on the labels, making them seem healthy. As we often note here at Doctors Health Press, though, processed foods have a lot of “hidden” ingredients on the back of their labels, too. Processed foods are packed with sugar, high-fructose corn syrup (HFCS), and sodium, and are stripped of most important nutrients as well as fiber. Although these steps are usually taken to enhance flavor, texture, and shelf life, they are not enough. As a result, other compounds are added to processed foods, and they could be harming your health. I’m writing this article to warn you about these dangerous additives, so you’re not left in the dark. Emulsifiers are included in processed foods for the purposes of extending their shelf life, improving their texture, and boosting their visual appeal. That all sounds well and good (albeit unnatural), but new research is showing that they could be contributing to inflammatory bowel disease (IBD) and metabolic syndrome by negatively impacting gut bacteria. There are literally trillions of bacteria inside your digestive tract that provide a number of services to your health. Together, they’re called your “microbiota.” These bacteria help your body break down food, absorb nutrients, and fight infection, and they play an important role in your overall functionality. However, these living things are also products of their environment, and your microbiota population can change based on several factors. For example, when you catch a virus, your microbiota changes. The same thing can happen based on your diet. It appears your microbiota can be altered by processed foods, with emulsifiers potentially playing a major role. They might alter your gut bacteria in a way that promotes inflammation by creating a species that infiltrates the mucus layer lining your intestines that is normally free of bacteria. IBD and metabolic disease are rather new on the scene, with their proliferation largely coinciding with the increased consumption of processed foods starting in the mid-20th century. IBD affects millions of people and includes Crohn’s disease and ulcerative colitis. Metabolic syndrome is a group of disorders commonly related to obesity, which can lead to type 2 diabetes, cardiovascular disease, and liver disease. The research I referred to earlier, conducted by Georgia State University, showed that two common emulsifiers (used in almost every processed food) had a significant effect on microbiota populations: polysorbate 80 and carboxymethylcellulose (doesn’t sound too appetizing, does it?) promoted an inflammatory population of gut bacteria that led to the aforementioned problems. Now the research team wants to extend their experiments to the human population, but in my opinion, the work has already been done. The correlation between processed food consumption and the incidence of these diseases can’t be ignored. There is an increasing body of research showing the importance of the microbiota in human health, how it is influenced by diet, and the detrimental impacts of a diet high in processed foods. So for the sake of your overall health, make the change to homemade and whole foods and skip the processed food aisle. Georgia State University, “Widely used food additives promotes colitis, obesity and metabolic syndrome, shows study of emulsifiers,” ScienceDaily web site, February 25, 2015; http://www.sciencedaily.com/releases/2015/02/150225132105.htm.